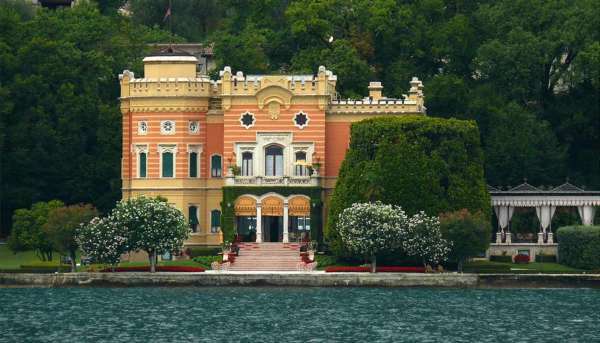 Villa Feltrinelli is located a few hundred meters north of Gargnano and is the most celebrated Gargnano building. It was built between 1892 and 1899 with design attributed by some to Francesco Solmi and, to others, to Alberico Belgiojoso. Inserted in a magnificent park, it is surrounded by other buildings that, in the past, were used as the residence of the caretakers and peasants who looked after the stables and the lemon groves. The façade overlooking the lake is the most sumptuous part of the villa, while the park behind the building includes precious tree species. Between October 1943 and April 1945 Villa Feltrinelli was the residence of Benito Mussolini, who resided there with his family. Currently the building has become the luxurious Grand Hotel at Villa Feltrinelli. We will sail in direction Gardone Riviera and Fasano, and then continue to north along the west side of the lake.